Does Trump (and some of his advisors) Deserve Being Labeled Sociopathic, Narcissistic, Paranoiac, Egomaniacal, Megalomaniacal, Xenophobic, Demagogic and/or Neo-Fascistic? A paranoid person or group exhibits excessive or irrational suspiciousness and distrustfulness of other individuals or groups. 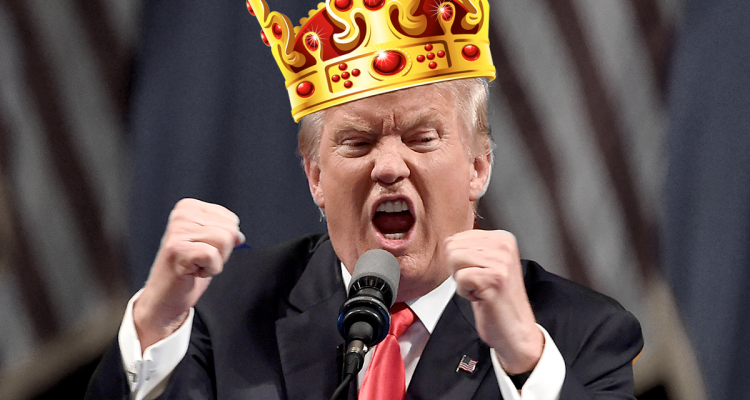 A megalomaniac is a pathological egotist, someone with a psychological disorder who exhibits symptoms like delusions of grandeur and an obsession with greatness, power or wealth. Once upon a time, there was a megalomaniacal, sociopathic, narcissistic and paranoid national leader who was attempting to rise to political power in his politically-divided, post-war nation. This deeply flawed demagogue, who was worshipped by millions of rabble-rousing, beer-swilling, racist, sexist, gun-toting, anti-Semitic, flag-waving, uber-nationalist, xenophobic white supremacists, professed that his goal in running for national office was only to make his supposedly weak, supposedly under-militarized country great again. This charismatic leader despised democracy, but was campaigning to become ruler of its nation. He was one of the richest men in his country but was despised by many voters. He was often joked about by comedians of the era. The candidate was often ridiculed, but he did impress those that attended his frequent campaign rallies by dramatically flying in to them on his private airplane. This leader often used inflammatory and hate-filled language in his speeches which often incited violence against minority groups from his followers. He was widely covered by the press as an aberration in the struggling, once-civilized, democratic nation that was looking for new leadership. This wannabe leader had amassed a devoted coalition of angry, under-employed, xenophobic white supremacists, especially from among the millions of physically and psychologically-wounded combat veterans from the last war who were easily recruited to participate in street-fighting for the cause. His followers exuberantly pledged allegiance to the nation’s flag. This leader’s nation had lost its last war, which had morally bankrupted the nation and also economically devastated it. The lost war had been stupidly started by an out-of-touch, over-privileged, ultra-wealthy, right-wing, pro-corporate, militarist, all-male leadership that was controlled by the nation’s bankers, industrialists and the politicians that were “owned” by the members of those two elite groups. Each of those three controlling groups knew that wars had huge economic benefits via the bank loans for war or by pillaging the resource wealth of involved nations, especially oil and minerals. The competitor nations that had been targeted by the nation’s banks and predatory corporations in the last war were technically not military adversaries. Therefore, in order to start the war, the political and military leaders of the nation had secretly conspired to orchestrate a false flag operation that alarmed the nation into war-readiness and the willingness to kill their fellowman. Like most wars, the next one, the candidate understood, would also have to be started by a false flag operation. The leader’s nation’s corporate-controlled media virtually never questioned any of the many deceptions that came down from the so-called ruling elites, and so the newly-demonized – and soon-to-be-unjustly-invaded – nation could easily be accused of provoking the upcoming conflict; and the brain-washed, min-informed, distracted, historically-illiterate, easily duped electorate could be counted upon to endorse the invasion. This particular megalomaniacal political leader intended to purge or co-opt most of the old establishment types from his adopted right-wing political party as soon as he achieved power. He had seemingly come out of nowhere and gained political notoriety and momentum after a world-wide economic collapse and the subsequent recession which had been fostered by powerful financial institutions and predatory investors. The leader cunningly refused to blame recent troubles on the guilty 1%, the uber-wealthy corporations, the war-hawks and assorted traitors that had actually been behind the loss of jobs and lack of economic security. Instead, he blamed the leftists, the liberals, the socialists and the democratic party members who had taken on the impossible task of solving the severe economic issues and the unemployment that they had not been responsible for in the first place. The nation’s economic crash had tanked the world economy and led to planetary chaos. But the economic crash had been ignited by the reckless actions of criminally-wealthy, manipulative, predatory, multimillionaires, who escaped the punishment they deserved because they were too big to criticize, too big to fail and too important to have their reputations tarnished. This megalomaniac and many of his followers were citizens of one of the most advanced, cultured, literate and highly Christianized nations the world had ever known. Unfortunately, the reigning religious leaders, totally contrary to the doctrines of Jesus and the original form of Christianity, professed a belief in a god that rewarded excess wealth and was a punitive, vengeful, violent and angry god rather than a merciful, all-loving, forgiving and nonviolent one as had been the belief of the founders. This nation was also highly militarized. It had had a long military tradition that was universally eared by the rest of the world and revered by most sectors of the nation, even though the officers and soldiers were frequently guilty of actions that were considered war crimes or crimes against humanity. This nation’s police and military had possessed the best military intelligence, the best spies and the most lethal weapons systems that the world had ever known – all at crippling economic costs to the tax-paying population and little or no return on investment (unless the wars had been won). The nation’s child-rearing tactics were often punitive (the spare the rod/spoil the child doctrine) which resulted in very obedient children and very obedient future soldiers and policemen who did not question the orders of their superiors – even if ordered to torture enemy non-combatants, for example. Thus, the nation’s soldiers quite easily became willing executioners in times of crisis. The leader’s followers were led to believe that their nation had been weakened by traitorous domestic and foreign enemies but would soon, if the leader was elected, be the great again. Many of the followers truly believed that their punitive Christian “god” would bless the leader’s mission and thus enable the religion to have dominion over all the other nations of the world, even if the methods to be used were anti-Christian in the extreme. Because the followers thought that their efforts were blessed by god, they naturally thought that aggressive action against any dissenters or strangers among them could be justified, even to the point of banishment, imprisonment, starvation, deportation, execution and torture. In other words, the followers of this obvious sociopathic demagogue – who had a history of being a serial liar with a desire to increase his already significant wealth and power – abandoned all logic and truly believed that the leader could actually make their country – and their religion – great again. In order to convince a plurality of voters to vote for him, the candidate fostered a paranoia among his followers that was intended to cause irrational fears (and therefore hatred) of non-citizens, the poor, the non-white, the non-Christian, the refugee, the asylum-seeker or the immigrant yearning to be free. Many refugees were fleeing from the consequences of wars, exploitation and economic chaos that the nation’s own giant financial institutions and multinational corporations had been responsible for in the first place. The megalomaniacal, sociopathic, narcissistic and paranoid national leader/fuehrer described above was Adolf Hitler, but could have been any wannabe fascist dictator in the history of the world. The militarized and economically-distressed Christian nation was Germany, and the war that had financially and morally bankrupted Germany was the First World War. However the similarities with Donald Trump or the Vietnam or Afghanistan wars are obvious. But the historical similarities between what I call Friendly American Fascism and the distinctly less friendly German variety do indeed exist, and it is not just the fault of Donald Trump. Indeed, Donald Trump probably has never taken the time to study ANY history books, much less writings about the root causes and conduct of what led up to World War II, so one cannot claim that he is actually following the historical playbook of fascist dictators of the past. History, as they say, doesn’t replicate itself exactly, but it often does rhyme. Donald Trump’s “Making America Great Again” political campaign does indeed rhyme with the campaigns of many other wannabe dictators throughout history. Napoleon, Mussolini, Hitler, Franco, Salazar, Mao, Pinochet, etc also proclaimed that they wanted greatness for their respective nations. But sociopathic, narcissistic, paranoid, megalomaniacal, xenophobic and demagogic leaders will say and do anything to gain and secure power and wealth. And the historical similarities between the psychological aberrancies of the fascist/fuehrer Hitler and far too many political and economic leaders in the world today do exist. Therefore, in the interest of educating those who are open-minded enough to sit still for some historical lessons, the remainder of this essay will try to make the connections between what has been said in the last political season and what might be in store for America in the next. The commentary below comes from established documents that are easily available in the psychiatric literature. I invite readers to do their own psychological evaluations of Donald Trump and other power-seeking politicians or the corporations from which they derived their economic power. One does not need a medical degree to look at the criteria for personality disorders and judge if any given candidate (or corporation) qualifies for a diagnosis of a personality disorder. Journalists do that sort of thing all the time and commonly make proclamations about historical figures having certain psychological diagnoses. Recall that both sociopaths and fascists are not to be trusted with political power, economic power or power over the military services. Both types consistently lie and deceive but usually never acknowledge that they are lying and deceiving. It is also important to understand that, for all intents and purposes, sociopaths and fascists (or their corporate counterparts) are incurable and need to be isolated from society. Below are official lists of personality traits that are needed to make the diagnosis of sociopathic personality disorder, narcissistic personality disorder and paranoid personality disorder. Readers can draw their own conclusions. The official Diagnostic and Statistical Manual for Mental Disorders (DSM) criteria for Sociopathic Personality Disorder (aka Psychopathic/Antisocial Personality Disorder) is listed below in bold letters. In each of the seven categories I have added, in italics, a few examples from the life and times of Donald Trump that supports his qualifications for being diagnosed sociopathic. Readers should make their own determinations and consider the implications if he was to become president. Sociopathy, it should be emphasized, is characterized by a lack of regard for – and a marked inability to abide by – societal rules. According to the DSM, only three out of the seven are required to qualify for the diagnosis. Repeated acts that could lead to arrest. Recall the multitude of charges of sexual assault or sexually-inappropriate behavior that have come from some of the women from Trump’s past. What happened could easily have resulted in Trump’s being charged with criminal sexual assault. On one of his many appearances on the Howard Stern Show, Trump actually laughingly admitted to being a sexual predator while in the presence of his approving daughter Ivanka and son Donald, Jr. Repeated lying, conning others for profit or pleasure, or the use of aliases. Recall Trump’s lying about knowing Russian President Putin; his criminal refusals to pay creditors for work done on his projects; and his infamous acts of self-promotion on radio programs by pretending to be somebody else. Being impulsive or failing to plan ahead. Recall Trump’s failed investments in THREE Atlantic City casinos in the 1990s, including Trump Plaza, Trump Castle and the Trump Taj Mahal in the already over-built casino sector. Analysts knew, but Trump didn’t realize that the three casinos were certain to cannibalize each other and that debt-service of the high-interest loans would be impossible. Within two years all three casinos declared bankruptcy. Recall Trump’s numerous sexual assaults, his infamous attack on the owner of a professional wrestling association during a match and his verbal assaults on foreigners, Muslims, Mexicans, protestors, assorted minorities, the disabled and the media. Reckless disregard for the safety of others. Recall Trump’s reckless disregard for the victims of his sexual assaults, his numerous frivolous lawsuits and his many bankruptcy filings. Failure to honor financial obligations. Recall his numerous bankruptcy filings that stiffed a multitude of creditors and workers that then resulted in dozens of downstream bankruptcies of smaller businesses. Rationalizing the pain that he or she has inflicted on others. Recall Trump’s refusal to apologize to anybody that he has lied about, sexually exploited, victimized financially or otherwise injured, including President Obama. A grandiose sense of self-importance, superiority and talent and expects to be recognized as superior. A preoccupation with unlimited success, beauty, brilliance, ideal love, power, or wealth. A belief in being special and unique and can only be understood or should only be associated with people of high status. Requires excessive admiration (especially applause). An unreasonable sense of entitlement and an expectation of being treated with favor or expecting an automatic compliance to his or her wishes. Is interpersonally exploitive, taking advantage of others to achieve his or her goals. Believes that others are envious of him (or is envious of others). Exhibits arrogant or haughty attitudes or behaviors. Paranoid Personality Disorder is summarized in the Diagnostic and Statistical Manual of Mental Disorders as a “pervasive distrust and suspiciousness of the motives of others that are interpreted as malevolent”. Documentation is best determined during a thorough psychiatric examination, but, in the highly competitive culture of America’s “dog-eat-dog” capitalism, paranoia may be the norm, especially among the “take-no-prisoners”, “fight-to-the-death” multimillionaires or multibillionaires at the top. Suspects without reason that others are exploiting, harming, or trying to deceive him. Has unjustified doubts about the loyalty or trustworthiness of friends or associates. Believes without reason that if he confides in others, the information may be used against him. Finds hidden or threatening meanings in harmless remarks or events. Persistently bears grudges and is unforgiving of insults or slights. Is quick to react with anger or to counterattack when he perceives that people are out to attack his character or reputation. Is suspicious of the fidelity of his spouse or sexual partners. Powerful and continuing expressions of nationalism. Rings True and certainly has been confirmed by his time in office. He, his family, his cabinet appointees all need to go. If we get rid of Trump, then we get Mike Pence who could likely be worse since Pence is a smooth operator. While the article above rings true and it makes anti-Trump people feel good because they have a specific target to hold in contempt, is the cult of personality and the specific personalities from Trump to his cabinet secretaries the essence of the problem in American society? If so, this implies that all was well before Trump and panacea awaits the land after he is gone. It is indeed very “sad” as Trump would say, that people are so conditioned in the liberal individualistic bourgeois value system to the degree that they focus almost exclusively on personalities rather than structures that produce such people operating in an existing institutional framework. Did Trump and his cabinet arrive in the US from a distant land, or did America’s hegemonic culture, to borrow Antonio Gransci’s term, give rise to such people and they simply carry out policies benefiting the socioeconomic elites? Wasn’t it Obama who candidly admitted that his administration’s neoliberal policies benefited almost exclusively the top one percent of the richest Americans? Whether Trump is indeed mentally ill (exactly how many of his cabinet officers and both Repubican and Democrat politicians are balanced and humane? ), the problem and thus the solution remain a structural one and that is where the focus must be.